Many Obsessive Compulsive Disorder (OCD) sufferers develop a hoarding obsession in which they cannot bring themselves to part with anything, including items that are utterly worthless. Although it is a common OCD obsession, hoarding is still one of the OCD symptoms that sufferers still feel a sense of shame about it as there is still relatively little known about hoarding in relation to OCD. This article looks at the link between hoarding and OCD. How Many OCD Sufferers Develop Hoarding? As a general rule of thumb, hoarding affects between 18 and 42 per cent of OCD sufferers, although hoarding can exist in isolation and does not need to be a symptom of OCD. On a basic level, hoarding is an inability to throw anything away. This usually means that hoarders live in a cluttered and chaotic environment, which can further add to the distress and anxiety that OCD causes. Some OCD sufferers only experience mild hoarding, while some experience more intense forms of hoarding. Procrastination – This can be linked to the indecision element of hoarding. If there is significant indecision about an object (or objects in general), hoarders will often put off making decisions at all. Avoidance - Following on from indecision and procrastination, hoarders will often postpone the idea of a clear-out indefinitely. Experts have suggested that living in a chaotic environment for a significant length of time can be the a sign of a deeper problem, such as depression or anxiety. Both are common amongst OCD sufferers. In comparison to other OCD symptoms, hoarding is quite difficult to treat. Whereas many OCD compulsions and obsessions can be treated with OCD medication, treatment for hoarding needs to start with the attitude of the hoarder. He or she needs to be willing and able to change. Cognitive Behaviour Therapy (CBT) is often used as a form of treatment for OCD, but there has been little research into hoarding as a symptom of OCD, experts are not currently sure how effective CBT would be as a treatment for hoarding. 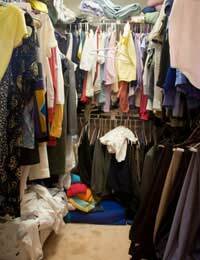 Hoarding is one of the symptoms of Obsessive Compulsive Disorder (OCD). It is common for sufferers to feel that they are alone in this, as a lot of research on OCD has focused on other symptoms (rather than hoarding). Although it sounds like a fairly insignificant symptom of OCD, hoarding can easily become all-consuming. Many hoarders feel unable to have anyone in their home, which can have a big effect on their social life and personal relationships. The indecision and perfectionism aspects of hoarding can also have a considerable effect on self-esteem. Hoarders frequently feel ashamed that they have “allowed” their house to become so cluttered and untidy, and this can prevent them from seeking treatment. If hoarding is allowed to spiral out of control, it can have a damaging effect on daily life.